In the past few years, beauty brands have begun to invest more time and effort in creating content that aims to connect with millennial women. 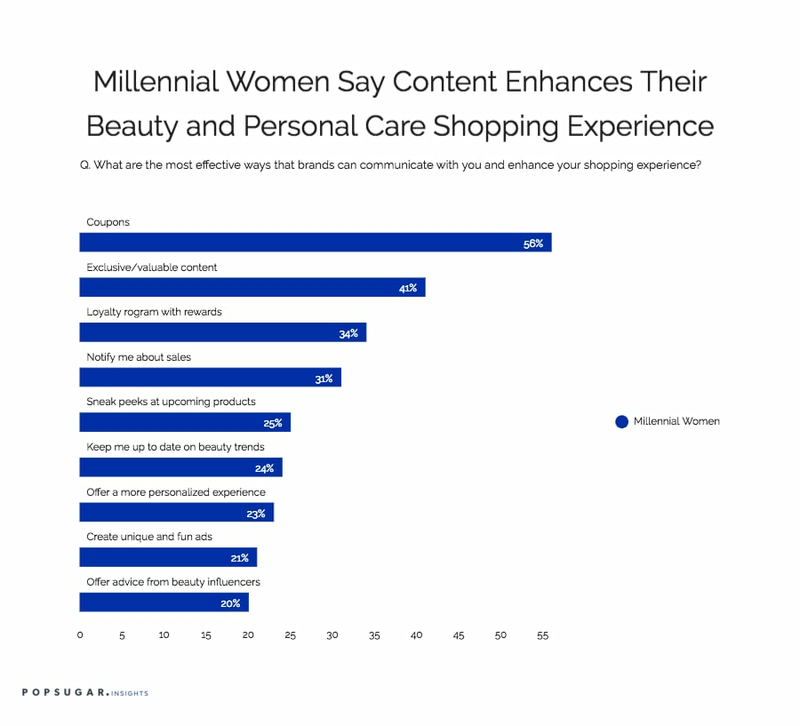 As part of the POPSUGAR Insights study "Beauty Evolved: How Millennial Women Shop for Beauty and Personal Care," we asked women to tell us what they think are the most effective ways that brands can communicate with them and enhance their beauty and personal care shopping experiences. Overall, millennial women are driven by price and convenience when it comes to beauty and actively seek out content that helps them save time and money. Therefore, it's not surprising that they feel that the number one way that brands can communicate with them is by offering coupons (56%). Millennial women also feel that offering a reward-based loyalty program (34%) and notifying them when items are about to go online (31%) are also very effective methods. From a content perspective, there are certain types of content that millennials gravitate toward. In total, 41% of millennial women said that content is a way to enhance their shopping experience. When you break that down, 23% of millennial women were interested in exclusive content, and 18% said that brands need to make sure the content is deemed valuable. In terms of the specific types of things beauty brands can offer with their content, 25% of millennial women want to see sneak peeks of upcoming products, 24% want to be kept up to date on key trends, and 20% want to receive advice and information from beauty influencers. Over one in five millennial women said they want beauty brands to create unique and fun ads, showing that consumers see the value in advertising, provided there's a user benefit to the experience. Women between the ages of 35 and 49 are 7% more likely to be interested in coupons than millennial women and 24% more likely to be interested in reward-based loyalty programs, but they are 15% less likely to be interested in expert advice from beauty influencers and 35% less likely to be interested in brands that offer exclusive content.